mom for his first check up. 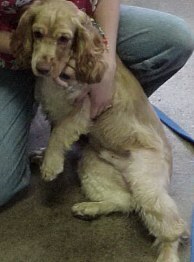 My Cody, how you've grown! 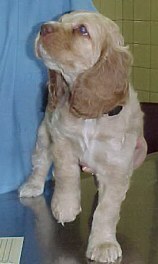 This is the same puppy, but now he's a "big dog"! This is Crystal who needs her annuals and thinks she is the queen of all she surveys. Could you tell her she's not?? 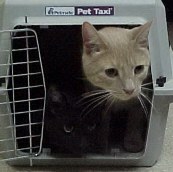 This is Peanut Butter & Midnight who came in with mom & dad for checkups and shots. Can you guess which is which? This is Zoie the Great Dane who was here with her mom Roberta and her dad Wayne for her annual checkup. What a sweetie!! This is Binky the Shihttzu who came in with his mom Debbie for his puppy shots. 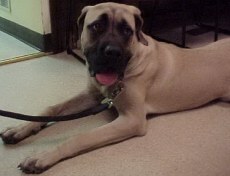 This is Rocko the Mastiff who came in with his mom Liz for a re-check. This is going to be one big charmer! Look at that face! 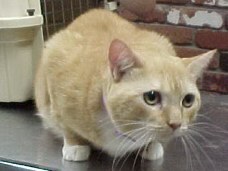 Liba was in with her mom Rose for a routine Diabetes check up. It will only hurt for a second cutie! 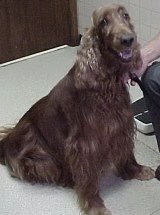 This is Gigi the Irish Setter who was with her dad John to check out an ear infection.